When Sir Francis Drake sailed round the world between 1577 and 1580, the only one of four ships that successfully rounded Cape Horn with the Golden Hind was ‘Elizabeth’. The two ships were separated in a storm and the captain of the Elizabeth, John Winter, turned back. 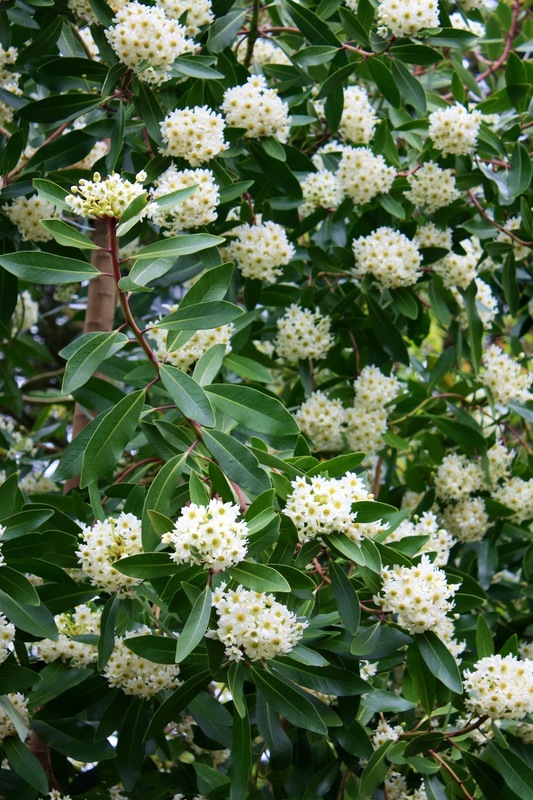 He sent a boat ashore to search out medicinal herbs and returned with a supply of Drimys bark. Centuries before vitamin C was identified, ‘Winter’s Bark’ was used as a preventive and remedy for scurvy, administered as a herbal infusion. Pictured here, smothered in jasmine-scented flowers, at the Harold Hillier Gardens, Winchester. Latin names are so much easier to remember when they have a good story attached to them. Glad you enjoyed today’s flower of the moment! Here’s another one I didn’t know about! – and to add that I’m a medicinal plants afficionado 🙂 Thanks for the very sweet candy.